Trello currently has an export feature which is available to all board members, including board Observers. It can be found under the Board Menu > More > Print and Export. The format is JSON, which lends itself well to technical usages, but doesn't load into common programs like Excel. Thus, the export is primarily for people looking to crunch the data with programs of their own or just to back up their data in case of emergency. It is not currently possible to import a JSON export to re-create a Trello board. Export your board data from the board's menu. As to our attitude toward your data, we are definitely pro-data portability. Please see https://trello.com/privacy. 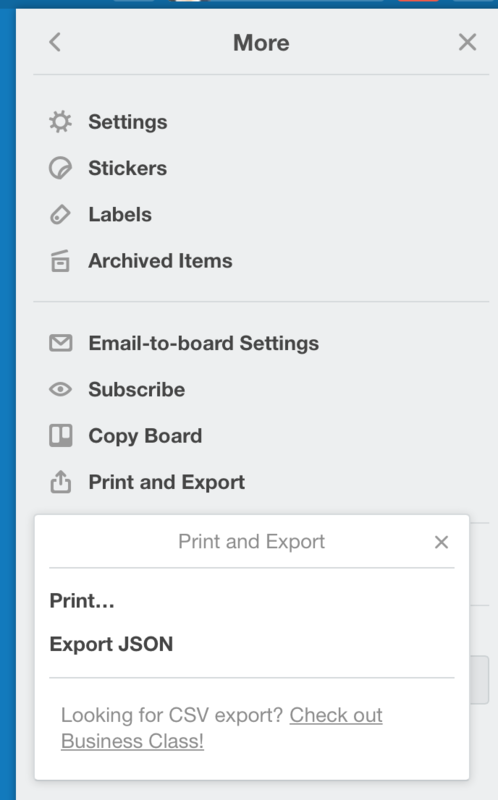 For more information about how to read Trello's JSON export, please see Making Sense of Trello's JSON Export. Trello Business Class lets you export all of the boards in your team in both CSV and JSON format. You can also include all of your attachments as a .zip file in their native format. To do so, go to your team's page and select the "Export" tab. Please note that you'll need to be a team admin to access the "Export" tab. See trello.com/business-class to learn more. With Business Class export your team's data with just one click. If you need spreadsheet support, boards exported with Business Class include CSV exports which can be imported in to spreadsheet applications like Excel. Each user in a Business Class team has an option on the board to export to CSV. In addition to the above, you can also export your personal data. We have another article for that that you can find here.